People lounging on the roof of the Duomo in Milano, above. From here there are great views of the modern city skyline, below. 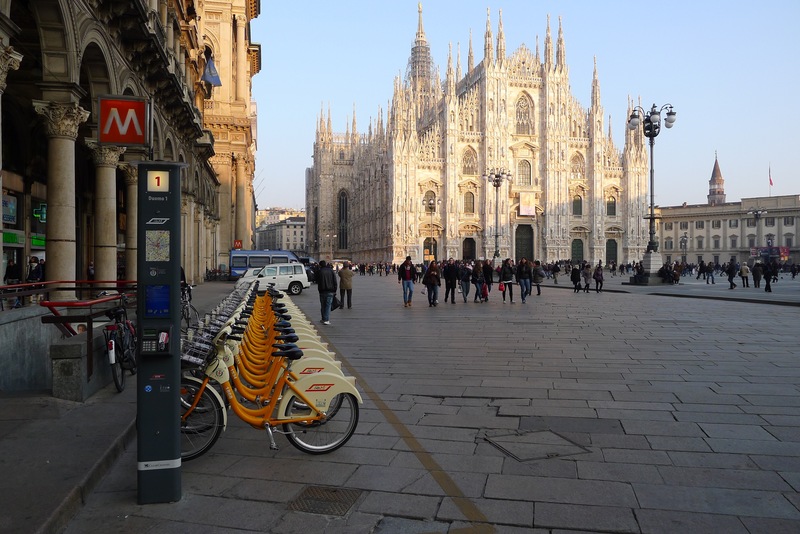 Yes, there’s plenty of bustle and traffic in Milan, but like all Italian cities, the center is built to a walkable scale (the neighborhoods for that matter, too). Happily there’s an efficient metro service that makes getting around a snap. …And more churches, some quite old and fashioned out of the ruins and remains of ancient Mediolanum, an important Roman and pre-Roman city. And instead of billboards, there’s a tendency in Milan (like Rome) to cover scaffolding and building works with ads. Here’s Elvis pimping vodka over a cocktail bar amusinglycalled Exploit. 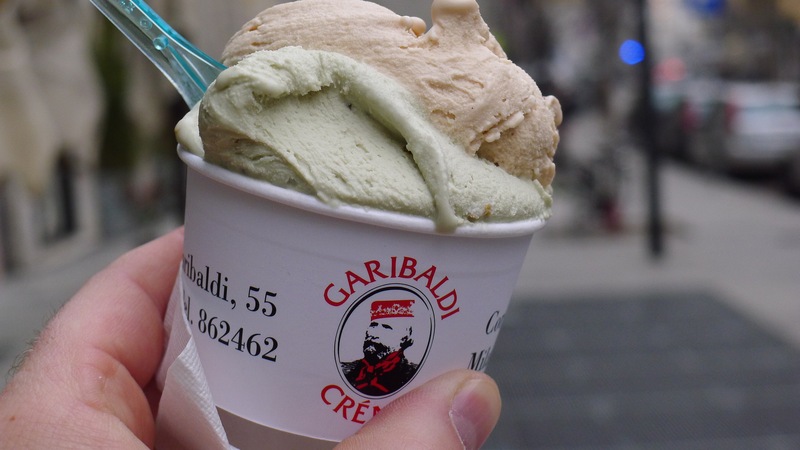 …Isn’t complete without a cup of artisan gelato in your hand! Apparently stencil graffiti is popular in Milan too. And I definitely did *not* eat here. But there’s a fantastic restaurant and bar scene in Milan, and, as I should have expected for a modern city of this size, there’s also a young, vibrant wine scene. Stefano Sarfati’s tiny bar has it’s natural wine manifesto covering one wall. Of course, when you can score ’04 Carema from the excellent co-op Producttori Nebbiolo di Carema for around 15 euros in a shop, it’s hard to leave the balcony at home. This entry was posted in italy, travel and tagged Absolut Elvis, gelato, Milan, Milano, Stefano Sarfati, Vin Sarfati. Bookmark the permalink. ← Do Consumers Even Like Barolo? Santa Catarina, brilliant stuff. Like their Vermentino too. Thanks for dropping back by — and yes, Santa Caterina is great! Too bad there’s not really enough to export. I also tried the vermentino and thought it was delicious, and quite racy too. That Produttori di Carema Riserva strikes me as seriously overpriced at 15 EUR, though. The cellar door price would be closer to 8-9, and its no more than a 70-minute drive from Milan… Having said that, even in the 15 EUR price range it beats most of the competition right out of the water.